I struggled for a long time on how I should store my copic markers. I found this beverage carrying thingy at Target over the summer and I have started storing my markers in it. So far, it is working pretty well. It has six compartments and I find that storing them by color groups works best for me. 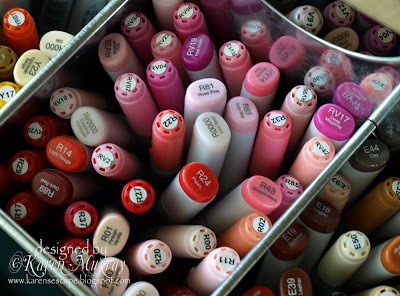 I store the E markers all together; the grays, black and colorless blenders together; R and RVs together; B, BV and Vs together; G, BG and YGs together; Y and YRs together; and the R and RVs together. 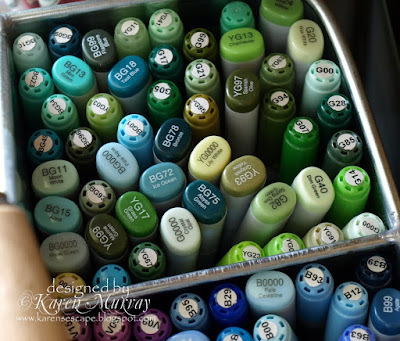 I started by collecting the Ciao markers and then filled in with the Sketch markers. I love the way the Sketch markers have the numbers on the cap (but not enough to re-purchase all my Ciao colors in the Sketch markers), so I took my Dymo label maker and made my own labels. I printed in the smallest size and used a 3/16 inch circle paper punch to cut them. It was the perfect fit for the Ciao marker caps and because the labels are already sticky it was super easy to do. Now I am able to easily find the marker I am looking for. 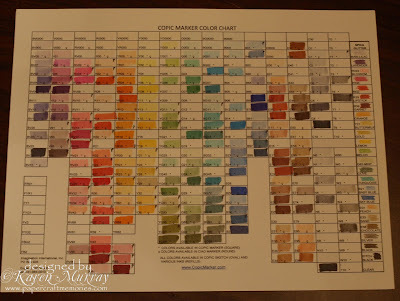 I used this chart from Sharon Harnist to keep track of what markers I have. It has all of the colors of the Copic markers and Spica glitter pens. I printed it out onto Gina K 80lb. paper, then colored in the spaces with the markers that I have. It is a great tool to use to find the colors I want to use as well. It is also great when I am looking for a certain marker, I know that if it is marked with a C on the chart that it is a Ciao marker. This has come in handy when they all seem to blend together. I have marked all of the markers that match Papertrey with a P on my chart, so I know right away which ones match my Papertrey cardstock. I hope this was helpful to someone. Thanks for taking the time to stop by. What a great idea. I still haven't started "investing" in these markers, but am looking forward to adding them to my stash in the future. Does it hurt to store them upright? Great idea Karen! TFS! Happy day! Very interesting. I just have two sets of 36 so I have been keeping them in their cases. When I buy my third set, I'll have to do something like you did. Thanks for the idea. I like this! I didn't see any of these at my Target. One thing I was looking for in a storage system was a good handle, I like that this one is high enough you can actually use it as a handle. ooooo i am sooo jealous of all those lovely colors! the storage seems perfect! I love your storage! I have to make the Ciao labels like you did. I mainly have Ciao's. I like the idea of marking those with a P for Papertrey--I think I'll do that on my chart too! Thanks! VERY helpful! I've been trying to organize my Copic markers for a while and have not found a good way to do it that fits my space.....this is wonderful! wonderful storage idea!! I really like it alot! I'm using the magpie shelving system currently but if I weren't - I'd look into something like this for sure! Oh my, you have quite the collection going. Like your storage solution. It's great to grab and go with it. 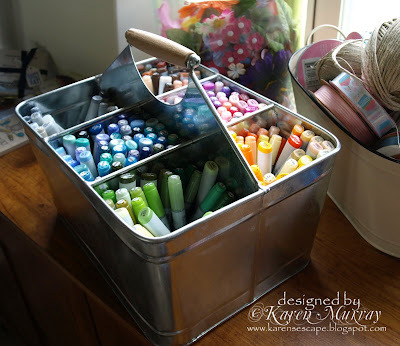 Have just stumbled across your blog looking for ciao/sketch marker storage ideas. Thanks so much for posting this. I will bookmark this, and look forward to following your blog.